Wondering how to create a WordPress theme right from scratch? No wonders, in this post we will explain you creating a theme from the scratch. Nowadays WordPress CMS is widely used all over the world. If you are a WordPress developer and the client prescribes to for a unique website with added features and functionalities of your own, then definitely it’s in your hand to satisfy the client’s needs. 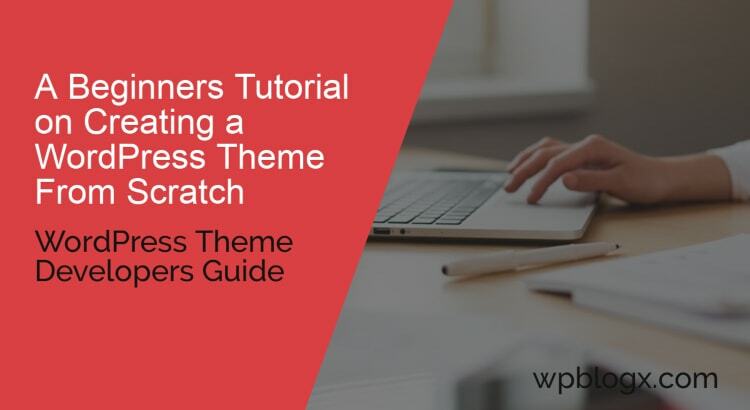 Or if you are new to WordPress and much interested in knowing how to create a theme from scratch, Or even for creating your own website, then am sure this article will definitely help you. All you have to know the basics of HTML, CSS, and PHP to create a WordPress theme. The themes you create will be present in WordPress root file -> wp-content -> themes -> list_of_themes. All these files contain a series of PHP template tags. These tags convey WordPress where to insert the dynamic content. Create a new folder in the themes folder of any name for example “bloomingflowers” where we will be creating the WordPress theme from scratch. Then create two new empty files in the folder. It can be named style.css and index.php. These two files are important to create a WordPress theme. Let’s consider a theme has basic files such as header, a footer, the main content(index.php), and a sidebar. You can create the WordPress theme files locally by using the code editor, and then you will be able to preview the theme design on your browser using XAMPP. WordPress actually reads the comments that are stored in the style.css file. In this file, you will give all the specific information about the theme that we are going to build. This stylesheet file is important for any WordPress theme. This file controls the layout and visual design of any website pages. In the following snippet, we have given the Theme Name, Theme URI, Description, the Author, the Author URI, and the version number of our theme. All these details will be used by WordPress, to display the details of the theme to admins. Make a note that you have to add it to the top of the file with no spaces before it. In the above code, you can even make changes if you want. The text between the <h1>tags and <h4> tags can be customized as you want them to display on your blog. You can make changes whenever you want, and since these are template files, your changes will reflect your entire blog. Now WordPress will read this particular file and grab the details in this files which are required to display in your page. Now you can add other PHP files as you required. <link rel= “stylesheet” href= “<?php bloginfo(‘stylesheet_url’); ?>”> → This line tells the WordPress to load style.css file and it is added after the title tag. <?php bloginfo(‘stylesheet_url’); ?> → It is a WordPress function that actually loads the stylesheet. Here in the footer, it will just be displayed as “This is the footer”. Here you can also add links, additional text, the copyright information for your theme to place it in the footer. Here the WordPress functions are called to display categories, archives of posts etc. By default, the WordPress function returns them as a list item, and therefore you must give this functions in an unsorted list as <ul> tags. And then finally add the various stylesheets in the style.css file to make your website look attractive. This file will give the basic looks of your theme. These lines set the page background and the main parts are surrounded by borders of your website. You can add images, animations and any other contents as per your needs for your website, and you can even modify the CSS file. Functions.php file is another important file to create a WordPress theme. This file does many things for your theme. Here you can place the code to modify the default behavior of WordPress. It is a kind of plugin where you add functionalities to your theme. Functions.php file is stored in your themes folder. It can execute only when the current theme is activated. This snippet will include the stylesheet in the custom theme. You might be wondering, why this custom function is needed when you can manually link the stylesheets in the file where it is required. When your theme goes deeper inside and becomes more complex, then it is difficult to link each and every stylesheet. In order to avoid confusion, and make your task simple this file is used. You will be happy using this function, once the theme requires to add more assets. When all your theme files are complete, then its time to install and check how it works. Hope you got an idea about creating a WordPress theme from scratch. If you have any suggestions or doubts, please feel free to comment to us. Good WordPress article for the beginners.